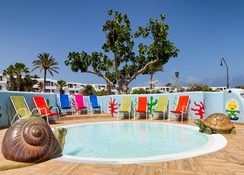 H10 Lanzarote Gardens is a remarkable hotel that offers bed & breakfast, half-board and all-inclusive accommodations. Ideal for families looking for an extraordinary holiday by the beach, it features a long list of kid’s friendly activities, workshops and facilities. There is a main restaurant that serves buffet meals and two bars that serves kids friendly drinks besides the regular liquor menu. 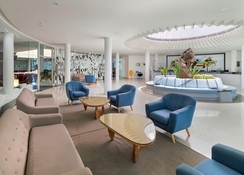 H10 Lanzarote Gardens offers two categories of guestrooms divided into Apartments (Double Apartments and Garden View Double Apartments) and Suites (Double Suites and Garden View Double Suites. All the 242 apartments and suites are furnished with functional kitchenette fitted with electric kettle, crockery, coffee machine, cutlery, fridge, microwave and more. Other common facilities are private bathroom with bath amenities, hairdryer, WiFi internet, sofa bed, air conditioning, safe deposit, TV with satellite and private balcony/terrace. Famara is the main restaurant that serves breakfast (7:15am to 10:30am), lunch (12:30pm to 3:30pm) and dinner (6pm to 9pm) in international buffet style. Breakfast is continental in style with plenty of options from both cold and hot items. And at lunch and dinner, you can enjoy local specialities and popular international items, complimented by alcoholic drinks. 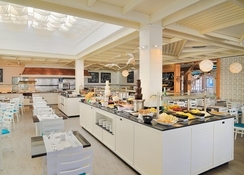 The restaurant also features live kitchen and offers special children's buffet. Paradise is the swim-up bar that opens between 10am and 6pm. 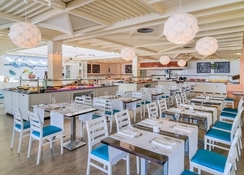 It not only serves cocktails and other alcoholic and non-alcoholic drinks but also special Daisy menu for kids. Finally, Bar Saló Río is the family entertaining bar that hosts mini disco, mascot Daisy and Disney shows—it serves liquors and opens between 8pm till midnight. The hotel features two common outdoor swimming pools and a kid’s paddle pool fitted with loungers and parasols—do approach the front desk for lilos and beach towels. 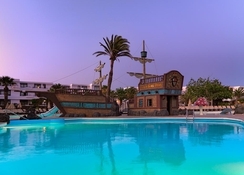 And as a children friendly hotel, it offers Baby Club (6 months to 3 years), Mini Club (4 to 8 years), Junior Club (9 to 12 years) and Teen Club (13 years and above). These clubs conduct a wide range of workshops, competitions and programmes, such as swimming, table tennis, water polo, football, boules, treasure hunt, handicraft, pottery, painting, paper mâché, play station, Wii, Xbox, board games and more. There are many sports for adults as well, including football, darts, mini golf, volleyball, water polo, archery, rifle shooting, Spanish classes, aqua aerobics and etc. And for a little leisure you can get a massage or pedicure and manicure, or just chill around the pool and enjoy the cocktails. 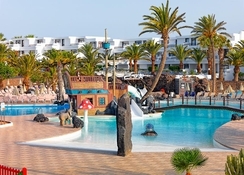 Located just 200 metres from Playa de las Cucharas Beach, H10 Lanzarote Gardens is a huge family oriented hotel in Lanzarote, Spain. The complex is built around three swimming pools and a massive garden and offers 242 apartments and suites. The beach is full of restaurants, bars, clubs, cafes and shops—Spar Mall is only 400 metres from the complex—but for more options, you have to travel to Arrecife, the capital city. Also, the city centre is hardly a few minutes by car and Lanzarote Airport is about 15 km from the hotel. There are many beaches in the neighbourhood and they offer tons of motorised and non-motorised water sports activities. Costa Teguise Golf Club is about 3.5 km from the hotel, and Arrecife's city centre is 10 km away. 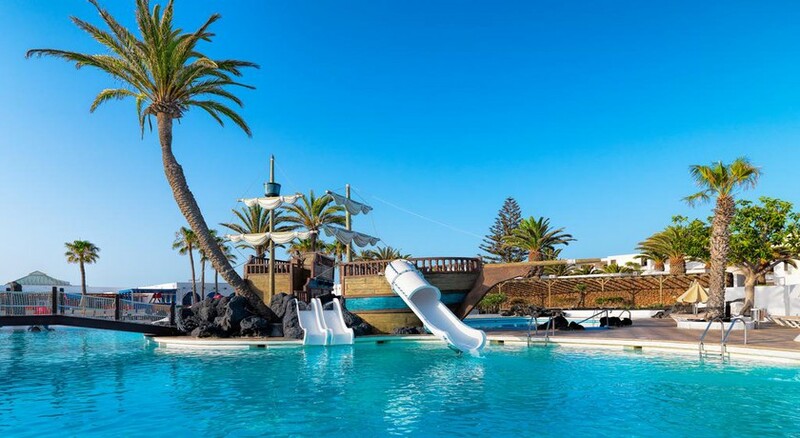 Hotel H10 Suites Lanzarote Gardens **** will begin with improvements works at the main pool the next 06/11/17. We will isolate the work area to minimize, to the extent possible, the necessary work impact (waterproofing, painting, drying, etc…). The expected duration is 1 month aproximately. The medium size adults’ pool and the baby pool will be available during this time. Life guards constantly looking at their phones, not watching water. Hotel room lovely, seated every night for dinner. Gardeners constantly out keeping on top of everything.